Dean Calvin Johnson, left, and Dr. Dan Givens, right, congratulate: Dr. Lindsey Starkey, Dr. Mahmoud Mansour, Dr. Randolph Winter and Dr. Joe Rowe. The College of Veterinary Medicine honored four faculty with the college’s top teaching awards, recognizing the work of exceptional teaching in the college’s mission of educating future veterinarians and biomedical scientists. 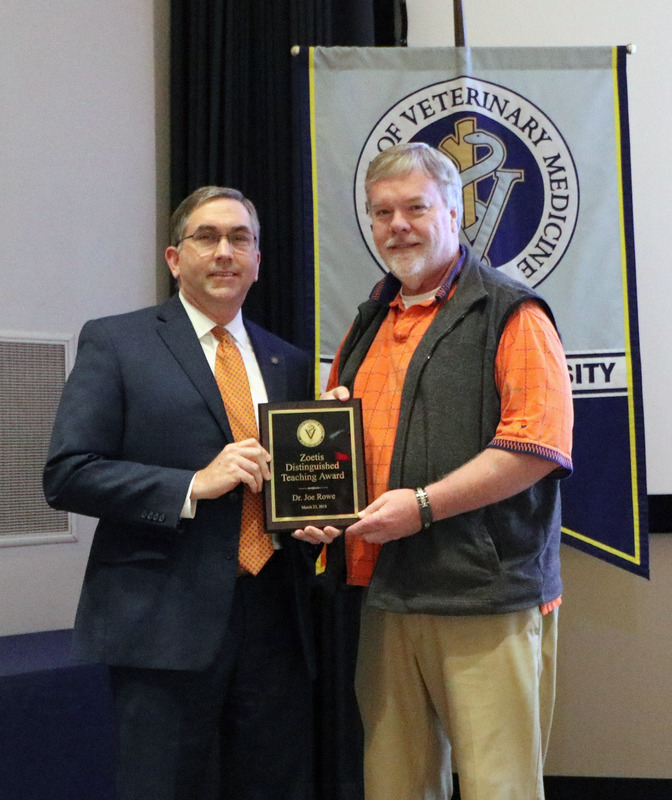 “The faculty honored are truly outstanding clinicians, researchers and educators and are exemplars of the numerous dedicated faculty at the College of Veterinary Medicine,” said Dr. Dan Givens, associate dean for Academic Affairs. “The college is fortunate to have many outstanding faculty who have a commitment to teaching excellence, and we are proud to recognize all of our faculty, and particularly these four, with awards,” Dean Calvin Johnson said. 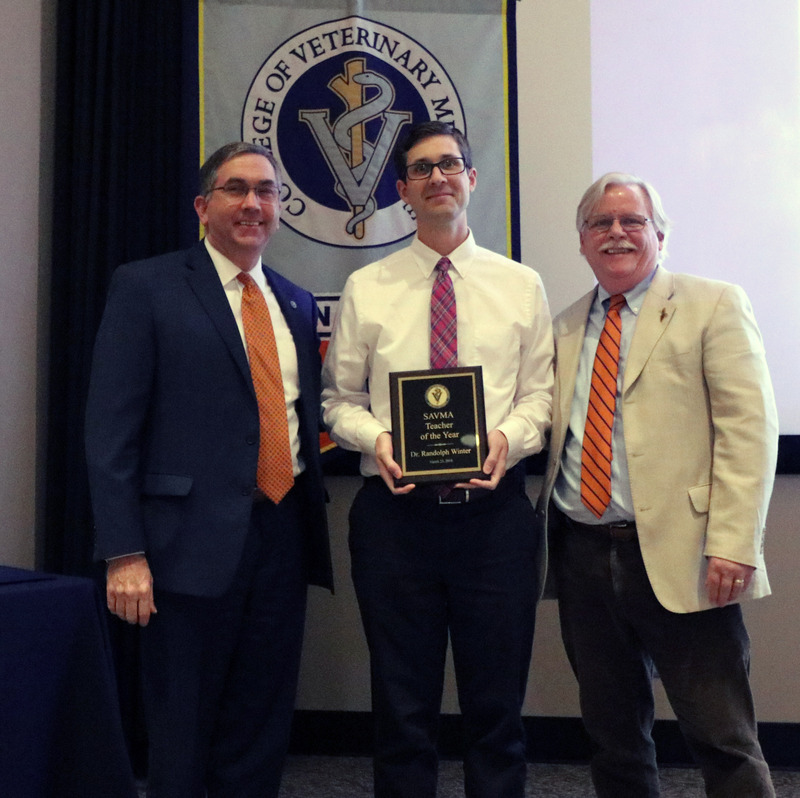 The Zoetis Distinguished Teaching Award was presented to Dr. Joe Rowe, an anatomy lecturer in the Department of Anatomy, Physiology and Pharmacology. Dr. Rowe joined the faculty in 2012 after working in a mixed animal practice for 24 years. Raised on a cattle farm in central Alabama, Dr. Rowe received his undergraduate and DVM from Auburn. Dean Johnson, Dr. Starkey and Dr. Russ Cattley, who presented the award. The Dean’s Award for Excellence in Teaching was presented to Dr. Lindsay Starkey, an assistant professor in the Department of Pathobiology. The award, given since 2000, recognizes an outstanding teacher, and the selection is based on student nominations. Dr. Starkey joined the faculty at Auburn University in 2016, and she teaches parasitology to first- and fourth-year veterinary students. She conducts a variety research projects, is involved in diagnostic parasitology and parasite consultation, and outreach. Dr. Starkey’s research interests include vector-borne infections, primarily those transmitted by ticks and mosquitoes, and food-borne parasitic diseases. 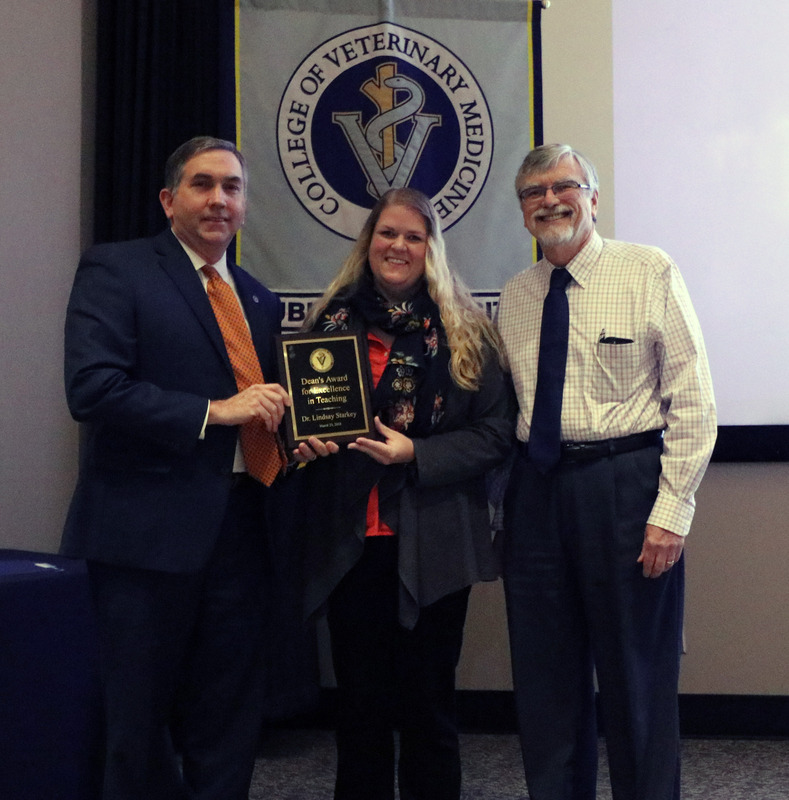 She completed both her DVM and Ph.D. at Oklahoma State University, and is a diplomate of the American College of Veterinary Microbiology, parasitology sub-specialty. Dean Johnson, Dr. Mansour and Dr. Elaine Coleman, who presented the award. The SGA Teacher of the Year Award was presented to Dr. Mahmoud Mansour, a professor of veterinary anatomy in the Department of Anatomy, Physiology and Pharmacology. A member of the faculty since 2006, Dr. Mansour He received his Ph.D. from the University of Liverpool in the United Kingdom, his DVM from the University of Khartoum, Sudan, and post-doctoral training at Michigan State University, where he was a recipient of Fulbright Scholarship. Dr. Mansour is the author of a veterinary equine anatomy guide series which he hopes will become the new standard of equine anatomy guides. Currently, Dr. Mansour and a team of investigators are studying the effects of select metabolic and toxic disorders on reproductive function in male subjects. Techniques utilized in the laboratory include RNA extraction, conventional end-point and real-time PCR, Western Blotting and Immunohistochemistry. 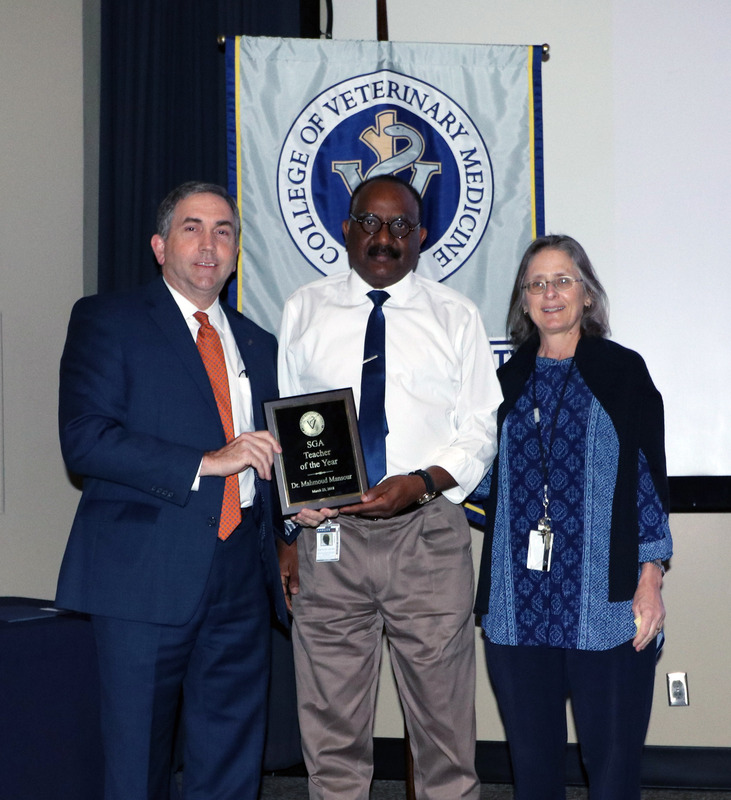 The SAVMA Teacher of the Year Award was presented to Dr. Randolph L. Winter, an assistant professor of cardiology. Dean Johnson, Dr. Winter and Dr. Jamie Bellah, who made the presentation. He received his DVM from Texas A&M University College of Veterinary Medicine and Biomedical Sciences, and completed a one-year internship at Colorado State University, and a residency in cardiology at Texas A&M. Dr. Winter is board-certified by the American College of Veterinary Internal Medicine (Cardiology). His research interests include interventional cardiology, diagnosis and treatment of myocarditis, myxomatous mitral valve disease and cardiac biomarkers.